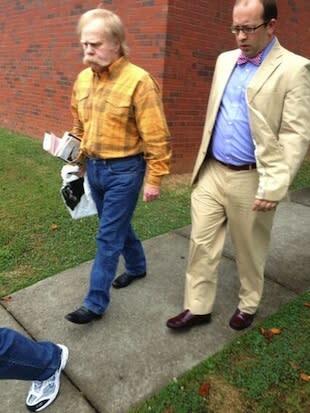 Guard your trees Auburn fans, Harvey Updyke has been released from prison. The man sentenced to prison for poisoning and ultimately killing Auburn’s famed Toomer’s Corner oaks, was released Monday after serving six months for one count of unlawful damage of an animal or crop facility. And apparently while he was inside, he took the time to take some grooming tips for the 1970s and grow a ridiculous mustache and mullet. Updyke, a rabid Alabama fan (Auburn's biggest rival), will now serve five years of supervised probation. The conditions of Updyke’s probation state that Updyke cannot attend any collegiate sporting events, cannot speak with media, is banned from Auburn University property and must abide by a 7 p.m. curfew. Also, he is not allowed to go to the Lowe’s Home Improvement store in Hammond, La., where he was arrested in September 2012. Updyke poisoned the famed trees in 2010 with a pesticide and then bragged about his crime on the Paul Finebaum radio show. Auburn city officials allowed the trees, which were used for toilet paper rolling following Auburn football wins, to remain until after this year’s spring game where they had their final roll. Auburn city officials have placed polls and wires as a temporary solution for this football season and will ultimately replace the trees. • Could facemask logos be the new craze in college athletic branding?